How to Recover Deleted, Lost Photos and Videos from Canon EOS Cameras? How to Recover Lost Photos and Videos from Canon EOS Cameras? Since its first appearance in 1987, Canon has released over 40 EOS SLR camera models till now. Though the EOS cameras have evolved through the years, people still need to use memory card to store their photos in. Then the problem arises, what to do if I accidentally deleted some photos or videos that I wanted to keep? If this kind of incident indeed happened to you, don't waste your time worrying or looking around, just read this article, which will show you how to recover the deleted photos and videos from your Canon EOS step by step. First of all, when you mistakenly deleted the wrong photos or videos, don't worry, relax, and stop using the memory card you deleted files in. If you continued to use this card, then the newly added data might took up the space of your deleted files, thus made them unrecoverable. The next thing you should do is to find a good data recovery program to recover your deleted photos and videos on Canon EOS camera. Here I recommend Card Data Recovery. Not only for it provides easy and quick data recovery solutions to both Windows and Mac users, but also for the reason that it supports all file types and devices, including the most used SD card and CF card. Since both Windows and Mac version are available, the tutorial will be divided into two parts, one for Windows users and one for Mac users. Before we proceed, please make sure you have downloaded and installed the Card Data Recovery. 1. Connect your Canon memory card to the computer, be it a SD card or a CF card, use the card reader to connect it to the PC, then run the software. 2. Click “Start”, choose your SD card on the left. 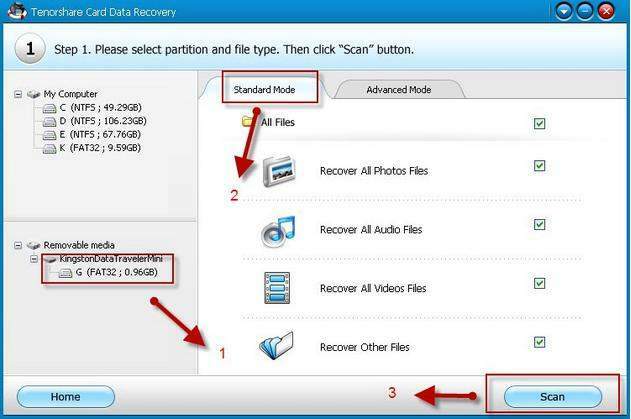 Then choose a recovery mode (If you know clearly what file formats your lost files are, choose Advances Mode which will just recover files of the file formats you choose) and the type of file you wish to recover and click “Scan”. 3. Select the files you need to recover after scan and click "Recover". Save the recovered files to your PC instead of your SD card to avoid overwriting. 4. Click "OK" to finish and check the recovered photos where you save them. After following this instruction, I believe you have successfully retrieved your deleted photos and videos. 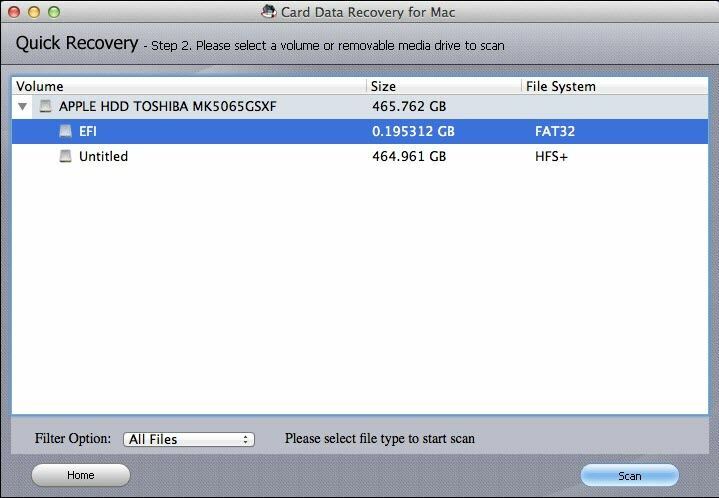 If you are a Mac user, and you have a Canon EOS digital camera, whatever the model it may be, when you have the need to recover the deleted photos and videos, please download Card Data Recover for Mac to solve your problem. 1. 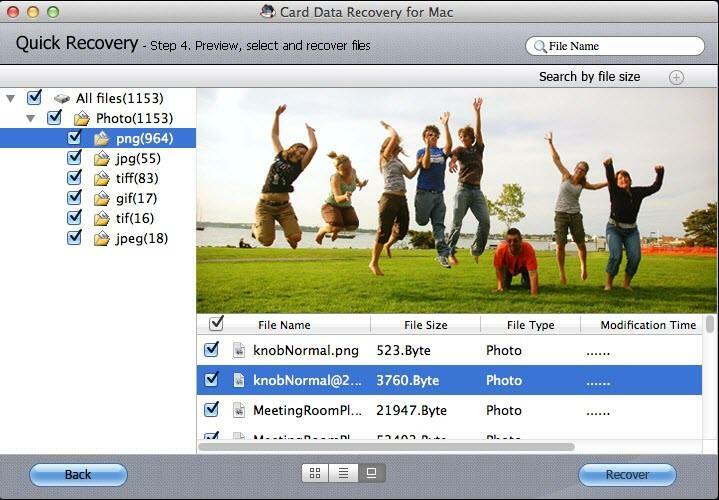 Connect your Canon memory card to your Mac, and select a recovery mode of Quick Recovery or Raw Recovery. (Quick Recovery could recover deleted files by commanding “Command + Delete” or emptying the Trash, or recover files from formatted or corrupted partition. And Raw Recovery is to recover the files you can't find with Quick Recovery by deep scanning your Mac, which will take relatively a longer scanning time). 2. Select your Canon memory card as the target device partition and file type you want to recover. And click "Start Scan". 3. Preview lost photos and videos from the scanning list. Select the ones you want o recover. And then click "Recover". 4. Save the recovered files on Mac. Please keep in mind: Never save them to your memory card on your Canon memory card directly. If you own a digital camera, such as a Canon PowerShot SD780 IS or Nikon Coolpix S9100, and the deleted photos problem bothers you as well, please read How to Recover Lost Photos and Video from Canon PowerShot SD780 IS or Nikon Coolpix S9100 to find out how to solve the problem. 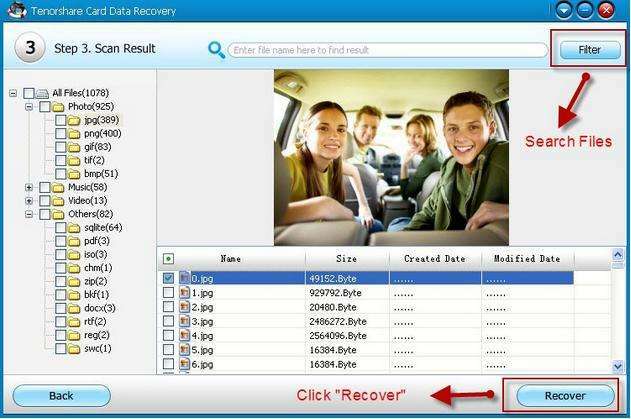 Best Card Data Recovery Solution -- Recover deleted or missing pictures, videos, music, Word documents, PDF files, etc. Recover Deleted Photos from Digital Camera's Memory Card?